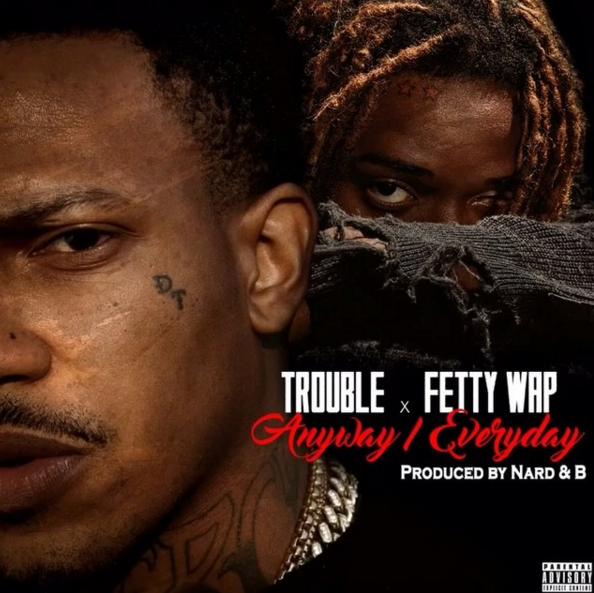 Trouble links with Fetty Wap for a tough street single, "Anyway / Everyday," produced by Nard & B.
Atlanta rapper Trouble has been on some big-time collabs lately, on tracks with guys like Thug and Lucci. He's now teamed with Fetty Wap for an R&B-tinged street banger, "Anyway/Everyday," produced by duo Nard & B, hot off an incredible placement on Future's Purple Reign tape. Trouble's singing flow sounds extra raw here. It's he, not Fetty, who drops the hook, and he really pulls it off. Fetty opts for a couple of extended verses, sounding right at home on the decidedly Southern production. Killer collab all around. "Anyway/Everyday" drops on iTunes this Tuesday, March 8. Stay on the lookout for Trouble's SkooBZilla mixtape, coming soon.